Clinical Pilates is a form of Pilates, an exercise and therapy method created by Joseph Pilates in the early to mid 1900's. As a treatment method, it was developed by Craig Phillips (an Australian physiotherapist) of DMA based in Melbourne, and is now used around the world. Clinical Pilates combines the principles of Pilates with the latest medical and physiotherapy research on back pain as well as the concept of core control or 'core stabilisation'. Clinical Pilates uses specially designed equipment including two large pieces known as the Reformer and the Trapeze Table. 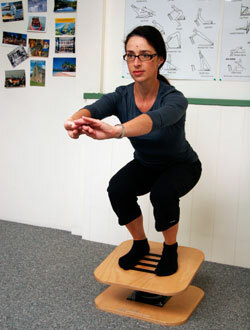 Using the equipment, you can perform a wide range of exercises using the arms, the legs and the whole body. Equipment is used to provide not only correct body positioning, but to supply proprioceptive information to the brain which makes it easier to learn how to activate the muscles correctly. Once your body has learned how to do the simpler muscle actions, you move on to more complex exercises and floor or mat work. Anyone wishing to improve their control of their 'core' muscles or participate in a form of exercise supervised by a fully qualified and experienced physiotherapist. Clinical Pilates commences with a comprehensive one hour assessment by one of our physiotherapists, where your concerns, injuries, limitations and goals are discussed and a full examination of your abilities and problems is undertaken. Following assessment we will discuss our findings and talk to you about our recommendations for your program. At this initial session you will commence some exercises and will be given a home program to work on which will complement your sessions at the clinic. Following satisfactory progress across several one to one sessions, you may then be eligible to perform your program in a fully supervised group session (maximum 4 participants). We recommend regular reviews of your program to ensure your goals are being achieved and your program updated to reflect your new abilities.